When and When not to Rescue Wildlife - Wildlife Rescue Team, Inc.
A lone baby/raccoon in the open or out during the day. A wild animal presented to you by your pet. Apparent or obvious broken limb. Call the WRT hotline at 402-473-1951 to speak to a rehabber and assess the situation. Squirrels: Baby squirrels can fall from the nest, especially during a storm. You can put the baby in a box temporarily and remove them from the rain or dangerous area (if a tree limb) came down, and then place them back outside in the box after the storm has passed. Mom squirrel WILL come looking for her baby! If you do NOT see Mom around over the course of several hours, take the box away and call WRT. Cottontail Rabbits: A bunny/rabbit who is five inches long with open eyes and erect ears are independent from Mom and able to fend for themselves. Always remember - if they can run from you - they do NOT need to be rescued! Nests of younger rabbits should remain undisturbed. Mom Bunny will feed her babies at dusk and dawn and will stay away to distract predators from the nest. Do NOT expect to see her sitting on the nest like a chicken! Keep children and pets away and let Mom do her job. One way you can be certain that the mother is returning to take care of her young is to criss cross yarn or sticks over the nest and by the next day if the yarn or sticks have been disturbed, you know she has returned. You can also peek at the babies and see if their tummies look full and they look healthy. If they do NOT look good (skinny, wet, full of fleas), call WRT immediately. Opossums: An opossum who is nine to ten inches or longer (not including the tail) is independent, just leave him/her alone. If you see an adult opossum that has been hit by a car, check to see if there are babies near her, especially in or near her pouch. You can remove the babies and call WRT. Raccoons: Baby raccoons will stay with Mom, and as they get older, will go exploring with her. If you find a single baby in your yard, especially during the day, call WRT for help. Raccoons will make their homes in various places that humans don't appreciate. Sometimes, understanding their behavior and a little patience, will allow Mom Raccoon to care for her babies without removing the family. Fawns/Deer: A fawn (baby deer) who is curled up in the grass and appears approachable is most likely waiting until Mom Deer comes back. Does leave their babies during the day to graze and then return in the evening to care for their fawns. If the fawn is up and around and bleating (crying), call WRT for advice. Nestling songbirds: If a bird is not feathered, it has probably fallen from its nest and/or the nest itself fell down in a storm. If you can put the bird and the nest back up in the tree or area where the nest came from, please do that. You can also take a plastic bucket/flower pot/ice cream container and poke holes in the bottom for drainage. Put the original nesting materials and/or something paper (paper towels, newspaper, toilet paper, shredded paper) and place the plastic item back up in the tree. You will need to secure it, so that the next storm or windy day cannot blow it down. The parent birds are probably watching you, and will return to their babies if they are able. If you do NOT see parent activity around the nest after several hours, call WRT. Remember - songbirds can NOT smell, so you can pick up the birds with your bare hands and put them in a container. If you feel better about it, feel free to use gloves or a towel. 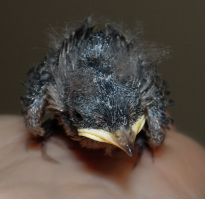 Fledgling Songbirds: A bird who is fully feathered with evidence of tail feathers, hopping on the ground but unable to fly, should be left alone. They are called fledglings and are learning to fly. Their parents will care for them while they learn to fly and their feathers continue to "grow". This process can take a few days. Keep children and pets away. If you watch and/or listen to the birds, and over the course of several hours, the parents have not returned, the fledgling might need help. Call WRT. Waterfowl: Many ducks and geese will nest in neighborhoods, especially near various lakes and water areas. When it comes time for Mom Duck to take her ducklings to the nearby water source, let her do it. If you can, ask neighbors and friends to keep dogs and children away and let Mom do her job. Many times, the ducklings will get separated from Mom and she will try to come back and get them. If Mom does NOT return, call WRT. Carnivores (bobcats, foxes, coyotes): Many times, something has happened to the mother carnivore before human find the babies. Call WRT for help. Foxes and coyotes also tend to have problems with mange. Call WRT for advice. Bats: Bats have the habit of getting into people's homes. If you can catch them and put them outside, put them on something that allows them to be "up" and fly away, like a tree or bush. Bats can carry rabies, so please be careful in handling them and/or call WRT for help. Reptiles/amphibians: Most of the reptiles that we get are turtles. If you see a turtle crossing the road, let it go where it wants to go, or help it on its way by moving it or stopping your car. Snapping turtles can be extremely dangerous, so please do not handle. In the late spring and early summer time, the turtles will come up because of rain or they are laying eggs. Just leave them alone and they will go on their way. If you find a turtle that has been attacked or hit by a car, the shell needs to be treated. Most of the snake calls that we get are because of a garter snake being in someone's yard or a bull snake being on someone's property. Snakes are actually good because they will eat bugs and vermin. If you see a snake leave it alone unless it is injured. Raptors: We are not permitted to do raptors. Please see the Raptor Recovery Nebraska information on our Useful Links page for their contact information. Remember: Do not give any food or water unless directed by WRT.